A change is comin’. Can you feel it? Most of us have been waiting a long time for a change like this to come around the bend, and now it may finally be here. If it’s up to (newly unstealthed) company Crossbar, the non-volatile memory landscape may never look the same again. 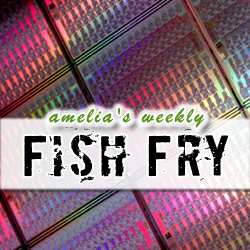 In this week’s Fish Fry, we investigate the newest in non-volatile memory technology with Crossbar CEO George Minassian. We chat with George about what Crossbar’s new RRAM memory is all about, what applications it can be used for, and how the industry is reacting to this new non-volatile kid on the block. Also this week, we look at design security in mainstream SoCs and give away an element14 MEMS Sensors Evaluation Kit courtesy of Newark element14. New Episode of Chalk Talk – What is Security in a Mainstream SoC?